Mavis Stevens visited our school this week. 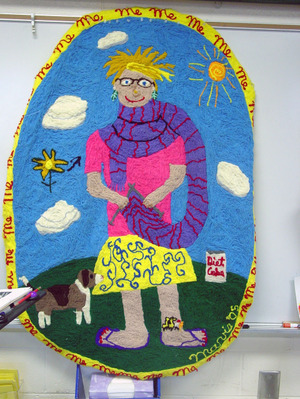 She is an extraordinary fiber artist from Buford, GA, and she is this year's GA YAM Honorary Artist. It was so wonderful to have her here at our school this week. "Miss Mavis", as we called her, visited with all 29 art classes, she told students about how she grew up as a little girl & realized how much she liked art, how good it made her feel, and how she wanted to always feel that way. She explained what fiber is, and how she narrowed down her technique & became focused on her particular medium. It is done with a special attachment to her sewing machine, and later on I will be posting a picture so that you can have a better idea about how she does her amazing art. Miss Mavis earns her living by creating and selling her art. Having her here this week has really inspired me, not only as an art teacher, but as an artist and mom. 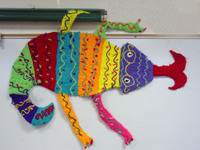 I am buying a lizard for my daughter Zoe's room that Miss Mavis created. I have even commissioned Miss Mavis to create a giraffe wearing Birkenstocks for Zoe's room also. Seeing Miss Mavis's artwork has gotten me so excited & inspired, that not only do i want to hang these pieces on the wall, but I am going to paint Zoe's walls with some crazy colors, with squiggle lines, and dots, and have a room "splashed with color"! I am so excited! 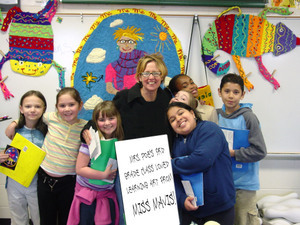 I really enjoyed having Miss Mavis here at our school this week. She has inspired me to create different things. What did you enjoy about her visit? How has she inspired you? Monday, March 6 was an AWESOME day here at JHH. To kick off Youth Art Month (YAM) & Music in Our Schools Month (MIOSM), we had Robbie Quinn come to our school, and he performed his fabulous art songs in 2 different assemblies. (if you aren't familiar with him, visit http://www.robbiequinn.com/?page_id=5 ) But that's not all he did. He spent the rest of the day visiting with the art & music classes, answering questions from students, and doing some acous tic performing. Many students had questions about Robbie playing the harmonica, so he gave them a little rendition. And one song students requested over & over again, was the color wheel. We all here @ JHH LOVE that song! Students even waited in line to get Robbie's autograph--- Robbie also talked to the students about one of his pieces of art------------------------------- Ever since Robbie's performance, students & teachers have been expressing to me how much they enjoyed it. But I want others to know what you thought of Robbie's performance. Why did YOU think it was so great? What was your favorite song? I loved his new song--"Red,Yellow, & Bluegrass"--I can't get the tune out of my head! Many of the students who did this project are still here @ JHH, and you can see their artwork when you visit the link as well. What do you think about the project? If you did it in art, how did it make you feel? Are there any comments you want to tell me? I can't wait to find out!